Visual design is an integral part of developing a website or app. By laying out imagery, typography, colors and other elements, visual designers shape both the experience and usability of a product. Good design is not only about giving your product appealing aesthetics, it’s about creating simplicity and clarity towards whatever goal a product wants its user to achieve. 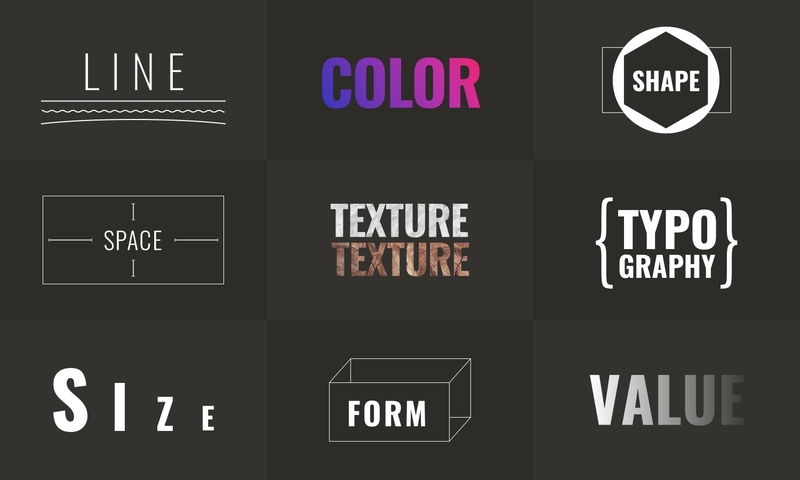 Here we introduce the elements: a set of building blocks that’s used to create a design. Sharpening visual design skills is an ongoing process of collecting inspiration, dissecting good design, reproducing, remixing, and experimenting. Start by taking a look at graphics you find appealing and think about what mixture of elements were used to create it. The line is the most basic element of design. It is any two connected points. Sometimes lines are straight, other times they meander. Color can evoke a variety moods and feelings. When used consistently, they also help create a brand. Colors can be used in combination with each other and/or applied to other elements. Shapes have boundaries that are defined by a continuous line or color. They can be geometric like squares and stars or organic like a handprint or flower. Space, sometimes referred to as negative space, is what surrounds elements. This negative space can be as important to design as the elements themselves. Texture is the look and “feel” of the surface of an object. It can be used to provide depth and evoke feelings depending on what the implied tactile feeling is like. Typography is essential for anything written to be communicated effectively. The style, arrangement and appearance of letters and text can provide the reader with more information than the words itself. The relative size of objects can indicate its level of importance and create visual interest. Form is the three-dimensionality of an object. In flat graphics, the appearance of form is often created using shadows to show depth. The value is how much white or black is in an object. It will affect how light or dark an object looks relative to another object. If you're ready to keep going check out Part II where we introduce some basic design principles, which gives us a set of considerations for how we can use these design elements.